Before starting afresh with VfL Wolfsburg last year, Switzerland’s Lara Dickenmann checked out at Olympique Lyonnais having excelled during seven trophy-filled seasons in France in which she cemented her name at the highest level, although there once was an era when it was someone else’s beat the two-time UEFA Champions League winner played to. Recruited by Ohio State University as she was making her way with the Swiss Under-19s, Lara came back to Europe in 2008 after a four-year spell in the U.S. that had gone a long way toward moulding her into the player and person she is today. Her return to the continent would eventually lead her to Lyon, where she was to experience a consistent stream of success, including lifting seven Division 1 Féminine titles and two Champions League crowns. The Zürich-born performer has featured in a variety of positions in her career and was pivotal in her country’s qualification for the 2015 FIFA World Cup in Canada – the very first major competition ‘La Nati’ had ever made it to. Lara, 30, led her side and the whole of Group 3 with ten goals as the Swiss stormed to the finals with nine wins and a draw, going on to represent the nation in Vancouver and Edmonton at the tournament. After playing the entirety of the 1-0 loss to the hosts in the last 16, Lara prepared for a new club season in a different setting, as she joined two-time European champions Wolfsburg. Domestic and continental glory is the goal once more for a player who is undoubtedly admired in the game, but she remembers where it all started, with the sound of a catchy vocal, driving bassline, and perhaps an unashamedly novelty-laden rap, too, taking her right back home. “My mom ran a fitness studio and she used to make music tapes for it, spending hours recording them, so I grew up listening to a lot of 90s pop-electro-dance-house-ish like Haddaway or Dr. Alban. There were these compilation albums called Bravo Hits as well; they had the best pop songs of the year on them and a new album came out every year. Searching deep within the connection music and football share is indeed the theme in the conversations with players on here, and beneath league standings, results and the like, there are so many stories to be found that bond the two. Although Eurodance claims the soundtrack to the days when local team SC Kriens had the early on-field talents of Lara, the five-time Swiss Female Player of the Year has branched out a little in the years since, and she explains how a song always seems to have a place in her day, no matter what the routine. “Yes, music is a very important part of my life. I listen to all kinds of genres depending on my current mood. When Ohio State signalled their interest in Lara her understanding of how college worked was sparse to say the least. However, she was to make a strong impact on the field in her first year, earning the honour of 2004 Big-Ten Freshman of the Year, as well as being named an NCAA Divison I Second-Team All-American. Taking in her first American football game at the Buckeyes’ Ohio Stadium (known as ‘The Shoe’), Lara’s focus of course lay with soccer, and she continued to enjoy her play in the college off-seasons. Playing in the W-League for New Jersey Wildcats in 2006, she was the division’s MVP and top scorer in 2007 with Jersey Sky Blue, the new side created with much of her old team’s personnel. The opportunities for skiing may not have quite measured up to back home but Lara loved her college days, citing the period as one which challenged her academically and athletically like never before. A memorable four years was topped off by completing her Bachelor of Science in International Business degree, and while it had been a whole new experience, there was actually a little link to Ohio long before her path ever took her to America’s Midwest. Lara recalls the first record she ever bought and it was by a certain artist from The Buckeye State. From the age of eight up until she was 14, Lara had played for the aforementioned SC Kriens in her local area, but a move to her first women’s team, DFC Sursee, brought national league and cup success and ultimately, her international break. Once she returned from college, she was part of an FC Zürich squad who became Nationalliga A champions and the winning rush was to become a familiar friend at her next club, Lyon. Although the semi-final of the last UEFA Women’s Cup (before its rebrand to the Champions League) was lost to eventual winners Duisburg, Lyon ensured they’d be back in Europe’s top competition by winning the league title at the end of Lara’s debut campaign. In May 2010, only a penalty shootout kept them from continental supremacy as they were defeated in Getafe by German side Turbine Potsdam, though Lara had been the second Lyon player to step up and had converted. A year later, however, they would be the ones celebrating. Playing at Fulham’s Craven Cottage, Patrice Lair’s team were once again pitted against Turbine Potsdam in the final, although this time they would win 2-0 to seal the club’s first European trophy. In front of 14,303, Lara made the game all but safe with the second goal in the final few minutes, after France centre-back Wendie Renard had opened the scoring. The 25-year-old defender has gone on to become an integral player for club and country, captaining both, and Lara remembers her alongside another key French talent for the part she played in her music memories of a ‘dream come true’ spell in her career. In 2012, Lyon achieved a historic treble with the league title, domestic cup and the Champions League, the latter of which was won in Munich’s Olympiastadion before a crowd of 50,212, with Eugénie Le Sommer and Camille Abily on target in a 2-0 victory over Frankfurt. The following season saw the club make its fourth final in succession, although they were narrowly defeated by Wolfsburg at Stamford Bridge as Lara came on for Megan Rapinoe to play the second half against her future side. With Patrice Lair stepping down in 2014, Gérard Precheur was the last coach Lara had at Lyon and what transpired to be her farewell campaign was a continuation of the success she will look back on and associate with playing in France. She scored in the crucial 4-0 win over title rivals Paris Saint-Germain last February as they won all 22 league games, as well as setting up Lotta Schelin’s goal while playing left-back in the 2-1 cup final success against Montpellier in Calais. Scoring two goals at the inaugural International Women’s Club Championship in Japan in November 2012 as Lyon won, Lara bowed out of the club early in the second half of the 14-0 win over relegated Arras in May 2015. She had provided an assist for Renard and headed home from Thomis’ delivery before receiving a standing ovation from her home fans at Stade Gerland as she left the field. Seven league championships went with the numerous cup-winning medals in Lara’s seven seasons at the club and after Switzerland’s elimination from the 2015 World Cup she stayed in Canada to watch her French teammates in their quarter-final with Germany in Montreal. Lasting friendships were formed in her Lyon chapter and when asked about any career teammates who stick in her mind for their vocal talent she began with a French midfielder she worked with during that stint. “Thankfully I haven’t (had to sing). Mélissa Plaza had quite a good voice and during the preparation for our Christmas party this year I figured out that (Wolfsburg’s Norwegian forward) Synne Jensen could sing as well. Although German-born, 1. 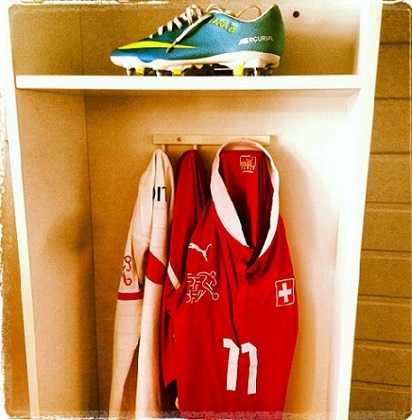 FC Köln defender Rinast is a Swiss international and was La Nati’s number 4 at the World Cup. Since 2004, the national team have had access to the training centre in Huttwil, which Lara believes has significantly aided their development, along with the winning mentality displayed by former Germany star Martina Voss-Tecklenburg since her 2012 arrival as head coach. As in various countries, efforts have been made in recent years to bring the male and female national team in line in terms of the respect level shown. Lara remembers the ‘Night of Swiss Soccer’ awards ceremony in 2009 where both squads were present, as were the popular Swiss hard rock band Gotthard, who performed. Aside from that free showing, Lara explains her concert wishlist, starting with a Mexican pop/rock band. “I would really love to see Maná in Mexico one day. I haven’t been to that many concerts, but hopefully I’m going to see Adele and Céline Dion this year. “The Pink concert was quite fun, Girl Talk as well. I’ve been to a Bon Jovi concert when I was younger, and my first ever concert was DJ BoBo when I was 11 years old. Last November, Lara started both legs of the Champions League last-16 tie with Chelsea as Wolfsburg knocked out their English opponents 4-1 on aggregate. It was a stunning strike from midfielder Vanessa Bernauer that opened the scoring in the second leg for the Green-Whites and she forms one quarter of the Swiss contingent in the squad. Along with Lara and 2015 FIFA World Player of the Year-shortlisted forward Ramona Bachmann, it is a California-born defender who makes up the quartet. She is also a player who makes sure her track choices get some airtime in the changing room, as does an aforementioned 19-year-old forward. “Noëlle Maritz is one of them and she mostly plays r&b, some hip-hop and pop music. Synne Jensen has good music, too; (it’s) mostly the younger ones, I guess. 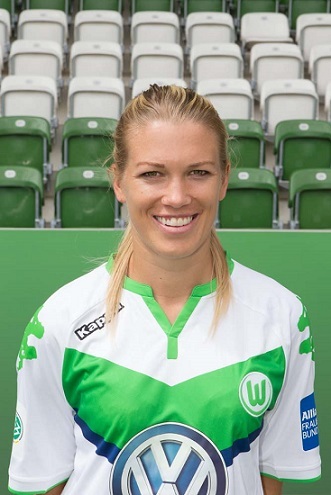 Following Sweden defender Nilla Fischer and Germany midfielder Lena Goeßling, Lara is the third Wolfsburg player to discuss music and football on here. When Euro 2013 winner Goeßling featured in December 2014, she told how Selina Wagner was the player in charge of the pre-game music, and the current Wolfsburg team will face the midfielder’s SC Freiburg side in the semi-final of the DFB-Pokal (German Cup) in April as they look to retain the trophy. In times when added motivation is sought, whether inside or outside football, music is a gift that can open new doors for us. However, if Lara was to skip listening to the songs currently out there and record a cover version of her own, with her choice of any career teammates to collaborate with, how would that look? For this, she chose to put together a six-member supergroup to rock a Californian band’s song she holds dear to her. In 2015, Switzerland appeared at the Algarve Cup for the first time, with Lara scoring a double in the 2-0 opening win over Iceland. Defeated by the U.S. before a draw with Norway in their remaining group games, the Swiss finished 8th in the competition after a loss to Brazil in the 7th-place game in Albufeira. At the World Cup, the team made sure that the red and white support in the stands didn’t just come from those rooting for hosts Canada. As well as the 10-1 thrashing of Ecuador – the only game Lara missed, as she was injured – seeing 53,855 at Vancouver’s BC Place for their last-16 game was an unforgettable highlight. La Nati want to create more moments that will live with them forever and securing their place at two major tournaments will give them the platform they crave. Voss-Tecklenburg’s team have started well with a 100% record from their first four games in Euro 2017 qualifying, although the most pressing priority is grabbing a place at this year’s Olympics in Rio de Janeiro. Next month, Switzerland will compete with Sweden, Norway and the Netherlands in a mini-tournament hosted by the Dutch team for the one remaining European place at the Games. With her club, Lara is also chasing considerable team objectives and she has been in the goals in each competition since she joined Wolfsburg. She claimed her first Bundesliga strike in a 2-0 home win against Werder Bremen at AOK Stadion in September and they will be the opponents when Wolfsburg return to league duty on Sunday February 14th. Like familiar title rivals Frankfurt, the Green-Whites are aiming to pull back champions Bayern Munich from their current 12-point lead, while Italy’s Brescia lie in wait for Ralf Kellermann’s team in the Champions League quarter-final in March. Clearly, Lara’s list of professional targets is well-populated at present, but it can be forgotten when talking about players that after the final whistle has gone and the spotlight of game day has faded until the next time there is a person that resumes their off-field life. What fills Lara’s time away from her football responsibilities and has she taken to life in her new country? “Yes, so far I’ve enjoyed Germany a lot. If we have more than one day off I like to go to Hamburg or Berlin; if we have a little less time, Braunschweig is nice as well. “I like to read, to knit and to crochet. I like to go out for a coffee, to go shopping, to go to the movies, and sometimes I play the piano, but not very well. Lara was just 16 when she debuted for Switzerland’s senior team in August 2002 and scored in a 2-1 win away to France at Clairefontaine. She has since surpassed a century of caps and marked her 30th birthday in November with a goal in the 8-1 away victory over Northern Ireland in the Euro 2017 qualifiers. With a younger brother, Joel, she had football fixed into her family from her father, himself a former player with FC Zürich. The game would take centre stage at weekends and be the backdrop when the family came together at their reunions. Maintaining an interest in tennis, one of Lara’s sporting heroes is compatriot and seven-time Wimbledon champion Roger Federer. It is of course football that has been a wonderful vehicle in her life, bringing her grand-scale experiences like the World Cup and winning silverware, but also the enrichment that has come from the people she has met and even little opportunities like being able to refine her French once she joined Lyon. That desire to learn has been crucial on and off the field and Lara explains why she will always be thankful for the game she has given so much of herself to. “I was rather shy when I was younger and I think through sports I got to travel a lot, meet a lot of people and learn about other cultures. It helped me with my self-confidence and the view I have on the world. There is a time Lara remembers at Lyon when the adverse weather conditions meant the team were temporarily limited to 5-a-side games indoors at training. As anyone who grew up playing football will confirm, there is nothing quite like a small-sided match for the intensity, competitive edge, and most importantly, the fun. 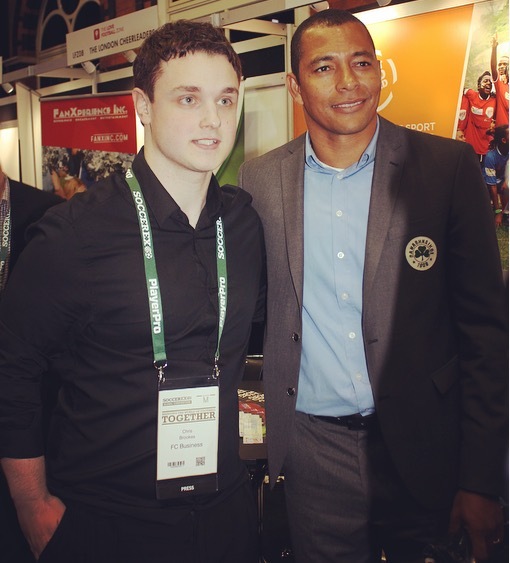 In recent years on here, I have asked each player to imagine they were taking part in 5-a-side, with their choice of any four teammates, from any time in their career, to join them in taking on another side. A big reason behind this question is to get first-hand insight into what it is like to work closely with certain players and what distinguishes them. For Lara, the Lyon years were genuinely special, so perhaps it should come as little surprise that she decides to take four from the numerous talents she worked with at the club to create her fantasy team here. “Shirley Cruz (midfielder), Kátia (forward), Sarah Bouhaddi (goalkeeper), Wendie Renard (defender). I chose all of them because they’re very technical, and a little bit crazy, except for maybe Wendie, she can be the calm and responsible one. “Sarah as a goalkeeper is very good with her feet, so she can be our first offensive player when we have the ball. Shirley and Kátia – you never knew what they were going to do with the ball. “They feel the game differently than we do; Brazilian style, I guess. Kátia can score goals from any angle and you can’t take the ball from her – she’s too strong, or used to be, I guess – and you can’t take the ball from Shirley either.